Foliar feeding has been used since 1844 when it was discovered that plant nutrients could be leached from leaves by rain. Experiments then proved that nutrients could also enter the plant through the foliage. Feeding the soil is the basis of organics. However, there are ways of stimulating the natural processes in the soil and in the plants by spraying the foliage, and this can provide some significant advantages. Foliar sprays such as fish hydrolysate (liquid fish), compost tea, liquid humate and seaweed are fertilizers. When fertilizer nutrients are sprayed directly on the foliage, immediate results can often be seen because the micronutrients, when taken in through the foliage, are immediately available to the plant. 1. Less is usually better in foliar sprays. Light, regularly applied sprays are generally better than heavy, infrequent blasts. Mists of liquids are better than big drops, unless you are also trying to control pests. The exception is spraying heavy enough to get the material to run off plants and also drench into the soil. 2. High humidity increases a leaf's ability to absorb sprays. Spraying on damp mornings or evenings will increase the effectiveness of the spray. Small openings (stomata) on the leaves close up during the heat of the day so that moisture within the plant is preserved. The best time of day to spray for pest control is late afternoon. Daybreak is usually best for foliar feeding. Spraying during the coolest part of the day is the key. Spraying during a light rain is ideal. You sure can't do that with synthetic chemicals. 3. Young foliage seems to absorb nutrients better than old, hard foliage. Therefore, foliar feeding is most effective during the periods of new growth on plants. 4. Adding sugar or molasses in small amounts to your spray solutions can stimulate the growth of beneficial microorganisms on the leaf surfaces. The stimulation of friendly microbes helps to fight off insect pests and harmful pathogens. 5. Foliar feeding will increase the storage life of food crops. It will also increase cold and heat tolerance of landscape plants and food crops. 6. Foliar feeding should not be used alone. Soil feeding is also needed to keep the roots from getting lazy. Drenching is the application of the same foliar spray mixes into the soil. This is an especially effective technique when applying beneficial organisms, such as mycorrhizal fungi, which require contact with roots to activate. My favorite drench product is Garrett Juice Pro. Personal experiments and reports from others have been impressive. 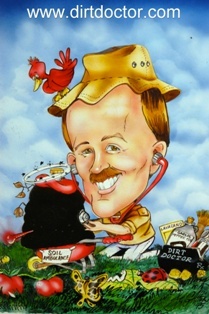 To discuss this newsletter or any other topic, tune in Sunday 8am -11am central time to the Dirt Doctor Radio Show. The call-in phone number is 1-866-444-3478. Listen on the internet or click here to find a station in your area.